Not to be confused with Nigel de Brus. Bruce was the second son of Sir William Waller Bruce, 10th Baronet (1856–1912) and his wife Angelica Lady Bruce (died 1917), daughter of General George Selby, Royal Artillery. He was born in Ensenada, Baja California, Mexico, whilst his parents were residing there. His older brother was the author and adventurer Sir Michael Bruce. He received his formal education at The Grange School in Stevenage, and from 1908 to 1912 at Abingdon School in Abingdon-on-Thames. 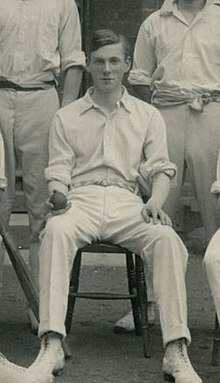 At Abingdon he was a keen sportsman, playing for the first XI cricket team (for which he received Colours), the athletics' first team and the school's football 2nd XI. In 1912, Bruce left school at the age of 17, and took up a position as a stockbroker's clerk in the City of London. In early 1914, whilst working in the City he voluntarily enlisted into the British Army's Territorial Force as an infantry soldier with the Honourable Artillery Company as its Private #852. On the outbreak of World War 1 in early August 1914, he was mobilized with the regiment, and went out to the Western Front with its 1st Battalion on 18 September 1914 at the age of 19. On 5 January 1915, whilst in trenches at Kemmel in Belgium, he was machine-gunned in the legs, causing multiple wounds and a fractured right thigh, and was subsequently medically evacuated to the United Kingdom, where he spent the rest of 1915 recovering in hospital. He was discharged from the British Army as medically unfit for further military service due to permanent damage to his legs in December 1915. In October 1916, he re-enlisted with the British Army and received training with an Officer Cadet Battalion in Cambridge, subsequently receiving a commission in January 1917, as a subaltern with the 10th (Service) Battalion, of the Somerset Light Infantry Regiment, a home service battalion, with which he served as a training officer for the rest of 1917, the permanent infirmity of his 1915 wounds preventing further active service at the front. After being discharged from the British Army, Bruce abandoned a career in the City of London Stock Exchange, and pursued a career as a professional actor. He made his stage debut on 12 May 1920 at London's Comedy Theatre as a footman in the play Why Marry?. In October of that year, he went to Canada as stage manager to Henry V. Esmond and Eva Moore, also playing "Montague Jordan" in Eliza Comes to Stay. Upon returning to England, he toured in the same role. He appeared regularly on-stage thereafter, and 8 years later began working in silent films. In 1934, he moved to Hollywood, U.S., as his career there became a success he set up a home at 701 North Alpine Drive, Beverly Hills in the latter half of the 1930s. Bruce typically played buffoonish, fuzzy-minded gentlemen. During his film career, he worked in 78 films, including Treasure Island (1934), The Charge of the Light Brigade (1936), Rebecca (1940), and Suspicion (1941). He appeared in two landmark films: Becky Sharp (1935), the first feature film in full Technicolor, and Bwana Devil (1952), the first 3-D feature. He uncharacteristically played a detestable figure in The Rains Came (1939) which became the first film to win an Oscar for special effects. Bruce's career signature role was that of Dr. Watson in the 1939–1946 Sherlock Holmes film series, alongside his friend Basil Rathbone playing Holmes. Bruce starred as Watson in all 14 films of the series, and over 200 radio programs of The New Adventures of Sherlock Holmes. Although Watson often appears to be the older of the two main characters, Bruce was three years younger than Rathbone. "If a mop bucket appeared in a scene, his foot would be inside it, and if by some sardonic twist of fate and the whim of director Roy William Neill he managed to stumble upon an important clue, he could be depended upon to blow his nose on it and throw it away." Rathbone however spoke highly of Bruce's portrayal, saying that Watson was one of the screen's most lovable characters. The historian David Parkinson wrote that Bruce's "avuncular presence provided the perfect counterbalance to Rathbone's briskly omniscient sleuth". Historian Alan Barnes notes that, despite the criticisms against him, Bruce rehabilitated Watson, who had been a marginal figure in the cinematic Holmes canon to that point: "after Bruce, it would be a near-unthinkable heresy to show Holmes without him". The Rathbone-Bruce co-star film series lapsed with the death of its producer-director Roy William Neill in 1946. Since then, most major modern adaptations of Arthur Conan Doyle's Sherlock Holmes stories, especially since the 1970s, have consciously defied the popular stereotype, and depicted Watson faithfully as a capable man of action. Pauline, married in 1946 the British flying ace Alan Geoffrey Page. Bruce, known as "Willie" to his friends, was a leading member of the British film colony in Los Angeles, and was captain of the (mostly British) Hollywood Cricket Club. Unlike some of his contemporaries, and along with other British actors such as Basil Rathbone and Charlie Chaplin, Bruce maintained his British citizenship, despite long residence in the United States. He also retained his membership of London's Garrick Club and Buck's Club until his death. His final film, World for Ransom, was released posthumously in 1954. Bruce died of a heart attack, in Santa Monica, California in 1953 at the age of 58. His body was subsequently cremated, with his ashes being placed in a niche at the Chapel of the Pines Crematory in Los Angeles. He wrote an autobiography entitled 'Games, Gossip and Greasepaint', which is unpublished, however excerpts have been printed in the Sherlock Holmes Journal, and these have been posted online with permission. ^ Obituary Variety, 14 October 1953. ^ Abingdon School register entry for Bruce. ^ Bruce's WW1 Medal Index Card, The National Archive, Kew, Surrey, England. Archive document code: WO 372/3/140620. ^ 'Famous 1914–1918', by Richard Van Emden & Vic Piuk (Pub. Pen & Sword, 2009). ^ a b Matthew E. Bunson (1997). Encyclopedia Sherlockiana. Simon & Schuster. p. 38. ISBN 0-02-861679-0. ^ Barnes 2011, p. 256. Barnes, Alan (2011). Sherlock Holmes on Screen. Titan Books. p. 224. ISBN 9780857687760. 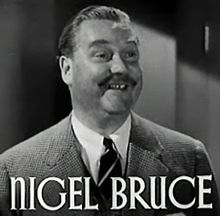 Wikimedia Commons has media related to Nigel Bruce.